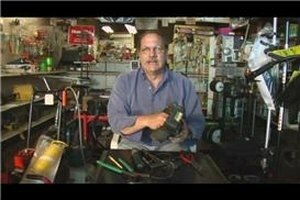 Learn how to tension the recoil spring in a lawn mower starter in this free lawn mower repair video. 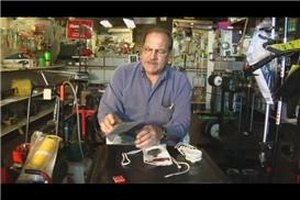 On Briggs and Stratton starters, or on any kind of starter really, you've got a recoil spring inside attached to the pulley and there's two ways to get the tension on the spring. One is to pre-load the spring, which you do in most Briggs and Stratton starter and then insert the rope and let the pulley rewind the spring, the rope. I'm going to show you how to do that first. Now I've made this tool, you can use anything, you can use a one inch square piece of metal or you can use a pair of vice grips or whatever you want to do to grab the inside of the pulley. We made this out of a starter clutch. You can notice that, remember when I showed you the starter clutch? This is a piece of starter clutch welded to a T-wrench and it makes it real easy for us to rewind the spring. Now, before you start winding it, think of which way you're pulling the rope so that you wind it the right way and you wind the rope wind the spring in, you're tensioning the spring. Now what you do is you take it all the way to the end of the spring until you reach the maximum tension on the spring all the way, you hear it? Kind of stop then you back it off and you'll see that the hole, I'll show you this in a second, the hole will lineup with the grommet. And what I do is I take a screwdriver, put it in here to hold that, you probably won't have that available to you, but anyway you can, just hold that. You take the end of the rope and put it through. You can use a little, I use a little poker to make sure it goes into the hole. And we got it. Now the spring is pre-loaded so its going to pull the rope back in. If you measure your old rope, that should be long enough. If the rope broke in half, you want to make sure that you have enough rope to pull. Then you tie the end of the rope. Burn it with a match so that the end of the rope won't fray. And your rope will recoil. Now the important thing that with all starters is that you don't reach the end of the spring before you reach the end of the rope because you'll break some of the ends of the springs are bent and you'll straighten them out and break the spring. You want to reach the end of the rope before you reach the end of the spring. Very important on all starters. 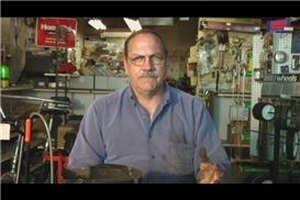 Dave Parke has been president of J&N Garden Equipment Incorporated at 4460 West Imperial Highway in Inglewood California for the last 32 years and has attended over 100 factory service schools. He is vice president of the Lawn Equipment Dealers Association and past President of the National Equipment Servicing Dealers Association for the last 10 years. He may be contacted at lnmwrguy@aol.com. Is Lemon Balm a Perennial?